This cemetery is one of three cemeteries that are side by side. The Carter Cemetery is the southern most. The three cemeteries are listed on the maps as the Forbis Cemetery. This cemetery is for Mr. Carter of the Carter Ranch, which is on both sides of the road. 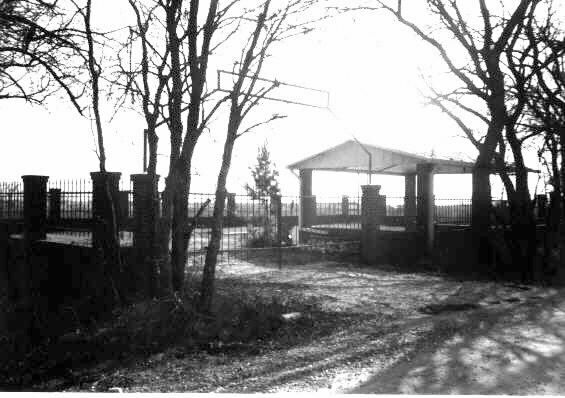 The cemetery has a 6-foot wrought iron fence with a large brick and concrete pavilion inside the fence. A metal arch spans the double gate. I believe that Mr. Carter is the only person buried in the cemetery. His stone is level with the grass. [This cemetery] is not listed in COLLIN COUNTY CEMETERY INSCRIPTIONS. The cemetery appears to be well maintained. At the time of my visit about 6 large cows were penned inside the cemetery.